Posted on January 2, 2014 by Tony F.
The three- and four-digit numbers on the Bus Stop IDs, found below the DART bus stop sign, are the unique numbers assigned to every bus stop in the bus system. This number has numerous uses for riders, especially now that the MyDART Trip Planner BETA has launched. You can use them to make sure you’re at the right stop. You also use this number to find out when the next bus is scheduled to arrive, find out if there are any alerts affecting your bus stop, or plan a trip from or to that bus stop. This ID number is referenced throughout DART and can even be used when calling a DART Customer Service representative for schedule information or reporting bus stop issues to DART staff. You will find Bus Stop ID numbers throughout the trip planning products. For example, when you click on a bus stop, the MyDART Trip Planner will include the Bus Stop ID number. The bus stop ID Number is presented at the top of the information box. 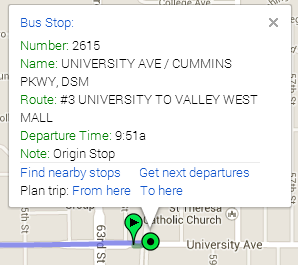 In this example, the bus stop at University Avenue & Cummins Parkway in Des Moines is #2615. The Google Maps trip planner also uses the bus stop ID when giving directions. In this example the bus stop ID is #2248 at Indianola Road & SE 14th Street in Des Moines. You can verify that you are at the right bus stop when you arrive by looking for this number at the bus stop. The bus stop ID on the sign should match the trip planner directions. Our friend and transit advocate Samantha, who throws a different kind of bus party in Cedar Rapids, recently emailed The Bus Blog a great video showing the potential business applications for publicly available bus gps data. As you’ll recall, DART is in the process of adding this technology to its fleet of buses, to be ready for public use by late 2012. DART faced a great deal of uncertainty at this time last year. The latest pedestrian accident was less than six months behind us. A budget shortfall lay ahead. The Transit Hub existed on paper but there was no money to build it. And the City of Grimes wanted out of DART. Now look at where we are. The accident rate is low and the only serious accident involving a pedestrian (actually, a kid on a bike) was completely unavoidable by DART’s operator and was covered as such by the media. The Transit Hub received not one, not two, but three grants in the past year — enough to build it start to finish. And Grimes decided to stick with DART after the launch of a Park and Ride lot at a new Walmart there. Not to mention this year’s discovery of Ron Cheatem, who is becoming a household name since he started doing a morning segment on WHO-TV on how the buses are running, reporting live from dispatch each weekday morning with his smooth baritone. Of course 2010 wasn’t perfect — let us not forget the service cuts in April — and there could still be surprises before next year arrives. But I can’t help but look toward 2011. We’ll be launching a big-picture planning study, dubbed DART Forward 2035, that will see the system map redrawn from scratch. We’ll start installing GPS technology on the buses, which will translate to real-time departure and arrival information for customers. We’ll break ground on the new Transit Hub in the spring and construction won’t stop until it’s finished, likely in 2012. So where will we be at this time next year? I don’t know, either. But I do know that we’ll have a better idea of what is in store for DART’s future, as all of these plans inch closer to becoming realities. If this past year is any clue, it’s going to be another sweet view next year. Look no further than Iowa City for a taste of using GPS technology to track your bus. Iowa City Transit, Coralville Transit and Cambus (the University of Iowa transit system) recently launched “BONGO,” or Bus on the Go, to give customers real-time information on bus routes on their cell phones and in their web browsers. You can select routes and see how close the next bus stop. 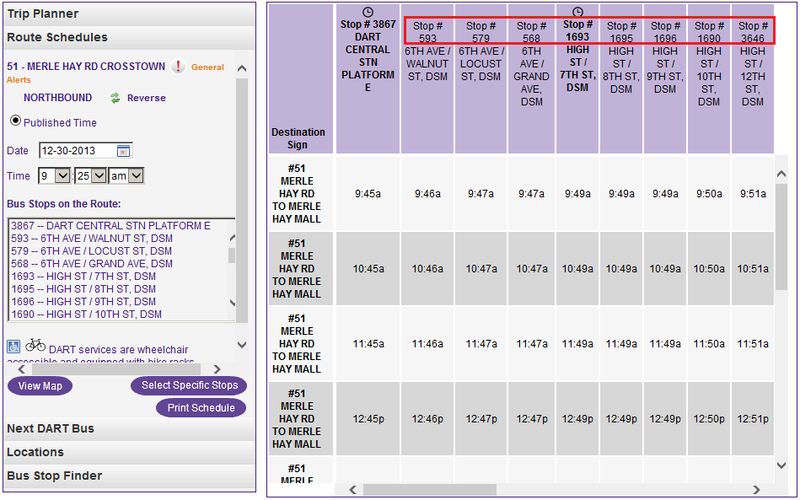 Or you can select your stop and view the arrival times of the next buses to stop there. This technology is in development for DART and is due to launch in 2012. — Adding GPS technology to DART’s fleet of buses is a go. Approved unanimously. Watch (and wait patiently, please) for real-time bus information fed right to your cell phones by 2012. — A big rethink of Greater Des Moines public transit is on. Approved unanimously. Keep an ear out for your chance to say what you think this fair city needs in a transit system in the coming decade. Study will kick off this fall. As for Grimes’ request to withdraw from DART, the Commission delayed a vote on whether to approve the request until after General Manager Brad Miller and Ankeny Mayor and DART Commissioner Steve Van Oort visit the Grimes City Council later this month. For more details on any of the above, check out yesterday’s post by clicking here. For still more details on all of the above, plus other material, a full agenda for the meeting is available by clicking here. is this the future of DART technology? As many of you know, DART is working to have GPS units installed on its buses. DART is current soliciting proposals from contractors to do the work, and they could be installed and ready to use by the public by 2012. Namely, riders will be able to get real-time information on bus locations sent right to their cell phones. We wish it could happen sooner, too, but these things take time. Meantime, check out what might be possible when it’s up and running. This web page features the real-time whereabouts of the underground trains of London. It was created by an independent web developer using open data. I keep hearing Des Moines is home to many techno-types, and I’ve met a few. Let’s hope some of them are also transit geeks, because we’d like to make the data stream available for them to play with so they can make smart-phone apps and web pages like this.